A more detailed description can be found at the Urban Dictionary. Do you do this webcomic because you HATE hipsters? No. The reason I do this comic is simply that I find “hipster culture” and typical hipster behavior very entertaining and great to poke fun at. Why DON’T you hate hipsters? Aren’t they, like, totally obnoxious and smug and annoying? Even though I’ll concede that many hipsters can be pretty annoying, I mostly find them entertaining rather than despicable. In fact, some good friends of mine could probably pass for hipsters, and, according to some of my other friends, so could I. And I don’t hate those friends or myself (much). ARE you a hipster, then? I heard you’ve made some OTHER Hipsters comics before you started with the webcomic. Where can I read them? It’s all listed in the Hipsters in Print category. You can read most of them right here on the Archive page. 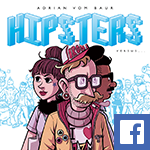 Will there be an English-language version of the Hipsters book? I don’t know. I’d love to make one, anyway! Are you a publisher interested in putting it out? Let me know! Got any other questions? Ask away!